Going to a theme park is one great way to enjoy a holiday. It would really be fun if you bring your family or your friends along with you. Taking rides and engaging in other exciting activities together with your loved ones would make a day spent at a specific theme park extra special and unforgettable. To have a fun day at a theme park, below are tips for planning your trip. Step 1: Choose a theme park. The first step is to select a theme park where you are going to spend a day. In doing this, you have to consult your friends or family. Ask them about the specific rides or certain activities they want to participate in. If you are bringing along little kids, make sure that the theme park has kiddie rides and activity centers that would enable them to have an excellent experience as well. Consider the location of the park and the amount you are willing to spend for your outing. Step 2: Do your research well. Do some research about the amenities that a certain theme park offers. In this way, you will know what to expect. You also have to find information about the security and the safety measures implemented at a specific park. These are important to ensure your welfare and enjoyment during your holiday. You also need to have a map of the park so you would not waste time going around in circles looking for entertainment booths. Step 3: Prepare the things that you should bring. It is important that you prepare the necessary items that you will need. Food in the park could be expensive, so if possible, you should bring your own snacks. Before doing this, however, you have to make sure that the theme park management would allow you to bring and eat your food there. Other items that you have to bring include your camera, cellphone, sunscreen, and cap. 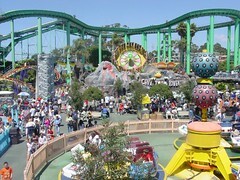 Going to the theme park is all about having fun and being kids at heart even for just one day of your life. Dare to take rides and have fun with your family or friends. Planning Beach Outing – Tips on planning a day out with friends and family. A theme park is a wonderful place to bring the whole family. There are different activities that each family members can choose to do individually or as a family. It is a great way to be together to enjoy, have fun and build memories together. There are a lot of different theme parks and we can do research on where the best way to go depending on finances, geographical location and safety is concerned. The bottomline though is that the family can go to a theme park just to de-stress and get away from activities that they regularly do. It is extremely important to check for weather forecasts on your local news or research it on the internet. It will be your one day away from work with your closest friends and family and you do not want to be drenched in rain or out in the striking sun. It will also help you prepare on what clothes and food you can bring. Ask for a map at the admission area of the theme park. Usually, they give that out for free. Instruct little children where to go in case they get lost. Evaluate first the area where the rest rooms and the food courts are. Well it is always better to prepare for any kind of occasion especially for a family outing. You should consider the time and budget spent for this kind of activities. You should also be well equipped with information, meaning you need to research, check if there are upcoming promos (save big on discounted prices) and the best theme park to spend your day. One thing that I really love about Theme parks are the rides! You should always consider the safety of the kids so always guide them in choosing the right rides for them, and always dare to have fun!